Thailand is investigating the two stolen passports held by passengers on missing Malaysia Airlines Flight 370, Thai Prime Minister Yingluck Shinawatra told CNN’s Christiane Amanpour in an exclusive interview on Monday. Search and rescue officials said Monday they will expand the search area for the Malaysia Airlines aircraft that vanished three days ago. 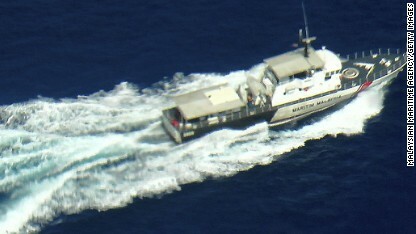 The Malaysian government has divided up the ocean in order to aid the search, she told Amanpour. While Thailand remains at the heart of the search for the downed plane, Yingluck herself has been at the heart of months of protests. (CNN) - Thailand's prime minister said Monday that his government is working to achieve normalcy in the country amid massive opposition protests, but warned it will take "time, patience and cooperation" from all parties involved. "We recognize that as every day passes by, the people of Thailand suffer, the country suffers, but we want to make sure that there is rule of law," Prime Minister Abhisit Vejjajiva told CNN's Christiane Amanpour in an interview set to air Tuesday. "We will try to enforce the law with minimum losses and we will try to find a political resolution, but it takes time, patience and cooperation," he said, speaking from Bangkok. "We will do the best we can and try to move the country forward as soon as possible." Thousands of anti-government protesters have brought Thailand's capital to a standstill this month as they seek to unseat Abhisit's government, which they say is illegitimate and undemocratic - accusations that Abhisit on Monday called "unfounded." The demonstrators - known as "Red Shirts" because of their clothing - support Thaksin Shinawatra, who was prime minister from 2001 to 2006, before he was ousted in a bloodless coup. Addressing allegations that his government is illegitimate, Abhisit said Monday, "We assumed office under the same means, under the same rules, by the same vote of parliament as the two previous administrations" elected after the coup. Abhisit emphasized what he described as his government's willingness to find a political solution to the crisis, but said resolution "must come at the right time for the country and serve the interests of everybody." "We recognize the differences of opinions and we think we should take them forward, but they should be conducted under conditions where there's peace, where people are allowed to express their opinions, and not under force or intimidation by a small group of people," he said. Abhisit has rejected a call from anti-government protesters to dissolve the country's parliament in 30 days. "It just doesn't make sense," he said Monday of the deadline, adding other groups' political opinions must be taken into consideration before any such action is taken. Some media and analysts in Thailand say civil war may be looming, with another group emerging called the "multi-colored shirts" who are urging the government to take tougher action against the Red Shirts. Abhisit told Amanpour on Monday that he is concerned about possible civil strife and said "we have been at pains to point out to people who disagree with protesters that they should exercise restraint, and we will do all we can to make sure that no clashes occur between the two groups of people." More than two dozen civilians and military personnel have died since protesters began occupying key tourism and shopping areas in Thailand's capital. The deadliest clashes occurred April 10, and Abhisit said Monday that his government would cooperate with investigations into those deaths, "particularly as carried out by the Human Rights Commission, which is a neutral body." He said the April 10 deaths appear to be caused by a group of people who call themselves "the Men in Black." "We have a number of clips and evidence to suggest that the Men in Black were operating among the Red Shirt people," Abhisit said. "We have to get to the bottom of that."